Golden Ring Hotel wins National Live.Venues Award 2017 as Best Business Venue for up to 300 guests! Winners of the National Expert Venue Award LIVE.VENUES 2017 were announced on September 13 in Moscow. With its Expert board and open voting the Award traditionally picks the most professional and convenient event venues in Russia. At the ceremony tops of the tops were determined in 13 nominations, as well as grand prix owner and special prize winners from the partners of the Award. 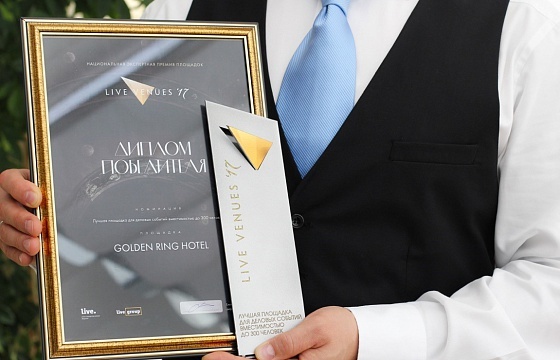 According to the results of the vote Golden Ring Hotel was picked as “BEST BUSINESS VENUE with a capacity for up to 300 guests”. We are proud and thankful to all of our guests and partners for support and votes. Thank you for making Golden Ring your choice!